Once upon a time, all my movie viewing at home was done on an amazing invention called a laserdisc player. These discs were 12″ the same size as a vinyl LP. Many people these days imagine that this large and clunky process was problematic, but nothing could be further from the truth. Laserdiscs are elegant and the artwork for the packaging puts most DVDs to shame. The Laserdisc pioneered the notion of special editions, deleted material, feature archive, trailers and second audio soundtracks years before the smaller DVD came along. The movie I watched today is from my collection of over six hundred laserdiscs that I acquired between 1990 and 2008. I have transfered many to DVD, but this one I watched on my still functioning laser disc player. The Rescuers was one of Disney’s 1970s features that showed how the animation styles had grown tired and stilted. The drawings of contemporary cites, buses and buildings, look flat and uninteresting. The characters move well enough but with one or two exceptions, the degree of attention paid to the animated performance was not up to snuff. The songs are cute but not memorable in any way. I am not saying this movie was a failure, it just shows how the studio had reached the end of the line. There were two or three features that followed this one, before “The Little Mermaid” revitalized the feature animation business. The script from the Rescuers may have followed the book closely, I don’t know, but it does seem that we jump from one scene to another without much reason or rhythm. The plot is OK, but it is very dreary from the beginning, and is actually quite grim for most of the movie. In the sequel, there was another grim scenario but it was made much more appealing by spectacular vistas and flying sequences. Disney’s latest traditionally drawn “Princess and the Frog” owes a lot in art design to the Rescuers. The two Alligator characters are templates for the gator in the recent film. The bayou setting has many of the same kinds of smokey images in both films. The southern accents in the Rescuers are much more comic in nature than accurate. It fed a stereotype of slow taking, lazy thinking southerners that I suspect people today would find offensive. 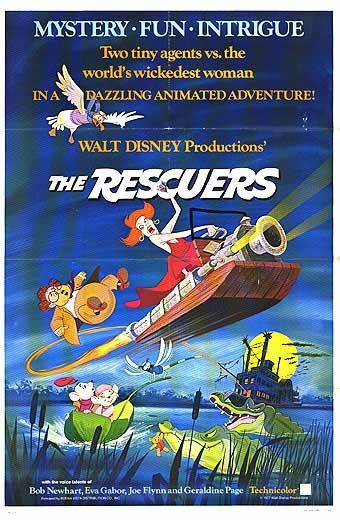 Speaking of offensive, there is an element in the Rescuers that you would never see in a politically correct movie produced in the current environment. One of the minor characters makes his own alcohol and then consumes it to comic effect. Later in the movie another character is heroically revived by taking a big swig of this moonshine and everyone celebrates how it helps save the day. Can you imagine such a sequence from a kid’s movie today? The studio would be pilloried by social and parents groups for selling the idea that alcohol has any redeeming features. 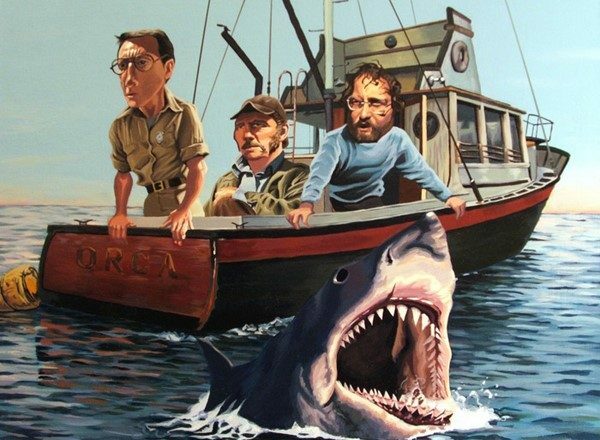 If this movie were being rated today, instead of a G rating it would probably get a PG-13 for drug and alcohol use. The voice actors were especially well cast and that makes up for some of the un-inventive animation. Bob Newhart is perfectly cast as the timid voiced but brave hearted Bernard. Eva Gabor is exotic and winsome as Bianca. They reprised their characters in the sequel as well. I was frustrated while watching the movie, trying to place the voice actor who played Mr. Snoops. I recognized the voice from the past but I could not quite put my finger on it. I finally cheated and looked on IMDB and it turned out to be Joe Flynn. He played the fussy and officious Captain Binghamton on McHale’s Navy. He did a dozen other Disney movies I’m sure. He died just a few days after finishing the voice work on this movie, which did not come out until three years after his death. There is a lot to recommend in the movie, but it has very little life and older kids are likely to get bored because there is really not action or comedy for a long stretch at the beginning of the movie. Dolores was working at Disneyland the summer this movie came out, we did not get any discount but I remember merchandise and displays in the Main Street shops that featured the film. If you had a pleasant memory of the movie and want to share it with your child, it would be alright. Just don’t expect the awe that comes with later Disney efforts or the classics from before Walt’s death.